This Christmas Eve here in Virginia dawned gray and rainy, as it did along most of the east coast. According to the weather forecast, the day will remain gray and rainy. The heaviest rain is likely to coincide with our church’s live outdoor nativity. There may be thunderstorms. At last year’s nativity, for the first time, our human participants, that motley, multi-aged crew of holy family, shepherds and kings, were joined by several four-legged friends. These included a burro, a sheep and a goat. 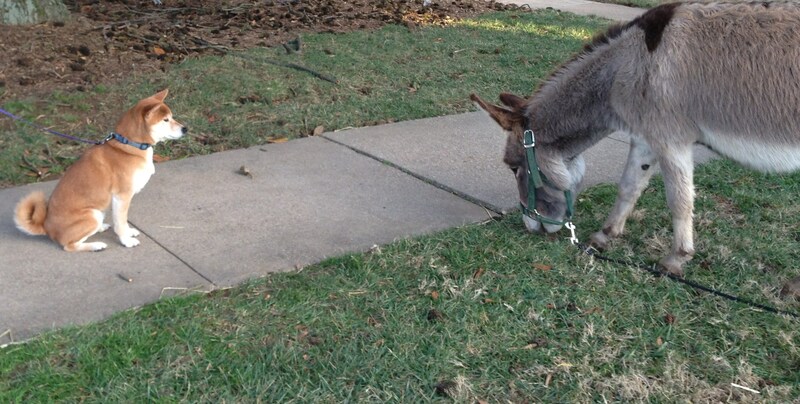 Kiko found the burro quite fascinating. 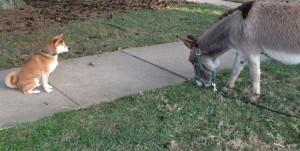 The burro ignored Kiko. 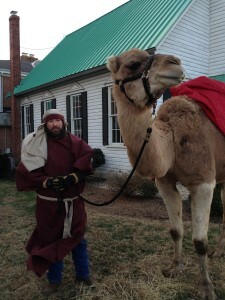 But best of all, there was Samson the camel. Samson surveyed the scene with a majestic air of intelligence and calm. He seemed to enjoy nuzzling his many appreciative fans. He and his mate Delilah, who had another engagement, live on a farm in rural Virginia. Samson’s handler appears with him in appropriately Biblical costume and beard. We all hope bad weather won’t keep Samson away. I doubt it will; he’s a sturdy sort. Last year, he was unperturbed in the face of a frigid, persistent wind. We know with absolute certainly that nothing can extinguish the true light of Christ that dawns in our dark world. It’s the flame that glows within us, if we let it, all our lives, illuminating our paths and those of others with whom we share the road. I wrote about that light in the darkness several years ago in a Christmas Eve post. It continues to express my thoughts for the day, and it can be found here. This Christmas Eve, may we feel the warmth of the miraculous light, and may we keep it burning. Previous PostOur Baby ElfNext PostMerry Christmas!